As a parent I try to expose my son to experiences that help him learn and grow as a person. One of the tools I use to help me is technology and apps. As my son has grown, we've used different apps in various ways including lesson learning. Note: This post is part of a sponsored campaign for Playing Forward. I received compensation for my participation, but my review and opinions are my own. So when I was contacted about reviewing the new Playing4ward "Maxi the Taxi Dog AR + 3D" App, it was a good fit. Maxi the Taxi Dog, is a children’s classic that was first published by Penguin over 25 years ago. Now it's been magically brought to life for a new generation. The main story in "Maxi The Taxi Dog" app is about helping a new friend solve a problem. In this case, Maxi meets Tupa, a night custodian at the Museum, who happens to be afraid of the dark! I don't want to ruin things by telling you the whole story, but there's a great lesson about how Maxi was a supportive friend to Tupa, which helps him over come his fear. Which is a great lesson for my son (or any child) to learn. But a lesson on being a good friend isn't the only great feature of the app. 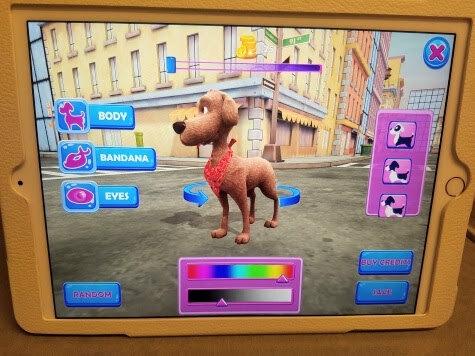 While I did mentioned the story-line in "Maxi The Taxi Dog", I want to point out that families can experience the story in 3D animation or Augmented Reality. With the Augmented Reality option, you can bring the world of "Maxi The Taxi Dog" into your home and interact with it. It's another way to bring the story telling alive for kids. Another great feature of the app is customization. You can choose from two storybook modes: full narration or read-a-loud. You can personalize Maxi the dog or Jim the driver to make look and dress however you like. Kids love adding personal touches in stories. 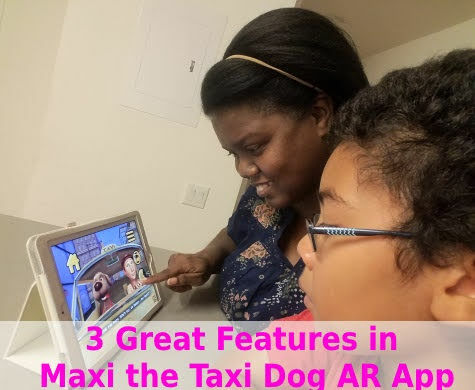 While I've only highlighted 3 features, there's lots for kids and their families to discover in Maxi the Taxi Dog AR App. To celebrate the launch of the app, Playing Forward is running a contest and you can enter to win a STEAM-powered weekend of play and exploration in Manhattan for a family of four! Playing Forward is a transformational technology studio that creates digital experiences that ignite children’s imaginations. 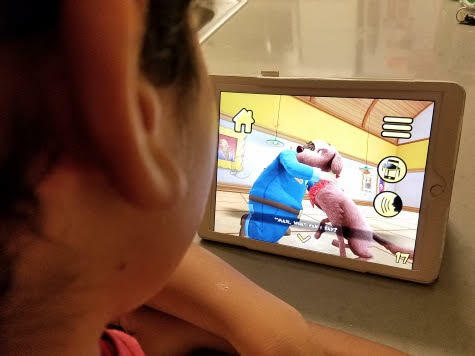 Playing Forward apps are specifically designed to support kids’ social-emotional development through entertaining storytelling, movie-quality visual effects, and the use of Augmented Reality. Playing Forward’s name comes from the fact that the company is “playing it forward” to give every child the very best shot at a happy childhood and a successful adulthood. Each story can be experienced in two ways: as a ‘bedtime story’ that can be read along with in 3D, and as a much more active ‘exploration’ in augmented reality, encouraging the reader to move around and experience the story from multiple perspectives. Playing Forward has now launched three character-driven apps based on books: a Penguin Publishing classic (“MAXI THE TAXI DOG”), a story from Stan Lee’s Kids Universe series (“DEX T-REX”), and Lizzy’s World featuring the STEAM-powered character from a new independent book series (“IT’S JUST SO…”).